There's this taxicab driver in Chicago, you see, and today is Christmas Eve. 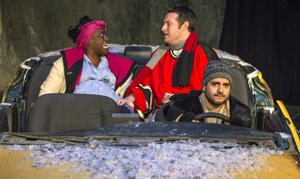 From this simple premise, Will Kern forged a play (originally titled Hellcab Does Christmas, but soon re-christened just Hellcab) that appeared year-round from 1992 to 2002 under the auspices of the legendary Famous Door Company. 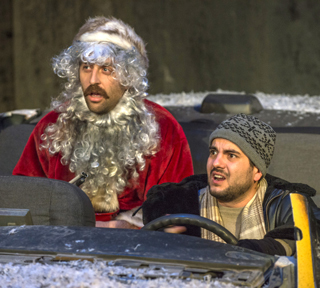 The 1997 film version allowed audiences worldwide to follow the humble hackie on his odyssey through a bewildering urban underworld, but in 2012, Kern's vehicle-for-hire returned home to become Profiles Theatre's annual holiday gift to its mother city. Though its setting remains 1992, the roster of passengers depicted over the course of the single day spanned in the narrative—a list encompassing druggies and amen-snorters, sweethearts and predators, the meek and the arrogant—makes for a wide range of humanity. After Profiles' decision to cast a different actor as each character, the possibilities were expanded. Without altering a word of the text, scenes in the current incarnation bend gender and color boundaries, as well as feature disabled, or elderly, or recognizably gay citizens in prominent roles—even a fifteen-second solo by a wayward Christkindlemarket musician adds to the diversity of the landscape traversed by the wide-eyed knight errant piloting his faltering automotive steed. Some of the changes from the original staging are the playwright's—the addition of a blind cane-carrying customer, for example, later conflated with a jaded street-Santa—but most reflect the choices of the individual artists. A male cross-dresser rebuffs her abusive boyfriend. A white-haired crone goes on a holiday toot in Uptown. A trio of cokeheads togged out in high-goth drag look for fresh supplies. An expensively-garbed male attorney extends an invitation for a quickie. How do thirty-three—that's almost enough players for two simultaneous baseball games-go about re-assembling this 90-minute live-action jigsaw puzzle every year? Shrugs director Eric Burgher, "I might have some of my own ideas going in, but it always starts with finding good actors—we auditioned nearly a hundred and twenty actors this year-and then giving them the space to listen, and move, and discover things at their own pace. As we get closer to opening, we tighten it up a little, but there's usually no more than an eight-minute difference from first run-through to opening night." The dialogue hints that the driver is a young man, with family in the industrial city of Rockford, just west of Chicago. The 2012 revival presented us with a Russian immigrant. For the next two years, Paul Dillon and Richard Cotovsky, veterans of the original Famous Door production, revealed drivers wearied by lives spent behind the wheel. This year's driver, by contrast, is portrayed by the youthful multi-lingual Bulgarian-born actor Zlatomir Moldovanski. "Yes, he's from a foreign country, and you can even hear a slight accent," Burgher concedes, "but that's not as important to understanding the driver's personality as the sense of his being an outsider. It's such a struggle for him to connect with the people he sees for this painfully short time, but he still tries hard. Zlatomir brings a vulnerability to the character, so that we really care about him. That's what led me to cast him." Burgher denies keeping records of which moments succeed better than others, "Every year we set out fresh from square one. Our sole purpose is to tell the best story we are capable of creating as a group. Our audiences always respond differently, whether from year to year, or from night to night—and I love it that they do." Hellcab runs at Profiles Main Stage to January 10.